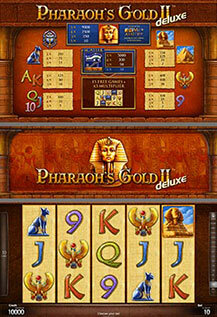 The new Pharaoh’s Gold™ II deluxe will captivate you! After countless aeons, the ruler of all ancient Egypt, the son of gods, once again graces the realm of mere mortals granting a glimpse of his wealth to those bravest at heart. Let this 5-line, 5-reel video game enthrall you! PHARAOH substitutes for all symbols except scatter and doubles prize when substituting. 3 or more scattered EYES trigger 15 Feature games with all prizes multiplied by 3. Feature games can be re-triggered and are played at current bet.